Having a system on the boat that helps keep you from rolling side to side is a very nice feature. There are a few types of stabilization- we've owned boats without stabilizers (Albin 36 Express Trawler), one with paravanes (Nordhavn 4637), and one with active fin (ABT) (Nordhavn 5020). Paravanes are pretty simple to use, even though they look complicated. They consist of long poles that we stored upright and when we wanted to use them, one of us went up above, manually lowered them over the side, like wings, and then dropped the 2 metal, 40 pound "fish" into the water. These swam about 15 to 20 feet under water and, as the boat moved through the water, they resisted being pulled up, dampening the rolling. 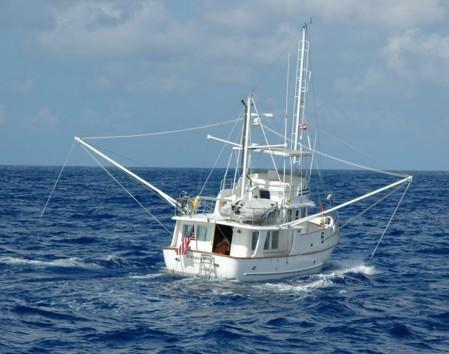 People often thought we were a converted fishing boat. 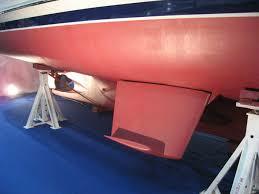 Active Fin: These are 2 fins attached to the boat under the water, one on each side. When activated, they rotate up and down (like bird wings or ailerons on a planes wing). Our active fin stabilizers use a gyroscope. When the gyroscope senses the ship roll, it changes the fins' angle to exert force to counteract the roll, thus steadying the boat. Both systems work well, but there are pros and cons to both. The paravanes, once one figures out the rigging and poles, are simple and manual. The paravanes are low tech and this makes it easy to see any problems and fix them. If chain and rope are well maintained, they just work. They did cost us about 1 knot when deployed, which doesn't sound like a lot until you are on a long passage. The other exception is when we snagged a crab pot in the dark in big waves. Or the time it became really shallow as we entered a rolly channel and we needed to bring them up right away. And there is no way we could have used paravanes on the east coast, because it was so shallow. With the active fin, as long as they're working, they are very easy to use in any depth. You push a button and they're active. However, as we recently discovered, if something fails, it's a lot more work to diagnose the problem and to fix it. It uses a motherboard, a number of cables, a gyroscope and fins under the boat that you can only access by diving under the boat or hauling the boat out. Our recent adventure with failed active fin stabilizers (which you can read about here), delayed our cruise by a month, cost us $3500, used the expertise of a number of people and put us in crawl spaces for a couple of days. When we called ABT, the manufacturer, and talked to Steve Ring, we discovered our stabilizer motherboard and panel were 17 years old. He said we were lucky the 'brick' (as that panel is called) lasted that long. So, with his help, we ordered a new panel, gyroscope and motherboard to be shipped to my mom's house in Boise (thanks for your help Steve!). We flew to the states, picked it up (along with a dozen other boat parts) and were very happy to get the 'green' light at customs in Mexico as we brought it all back. 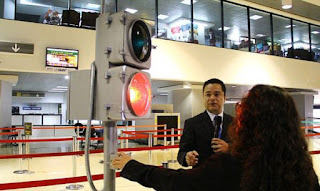 At Mexican customs, you push a button on your way out. If you get a green, you're good to enter the country. 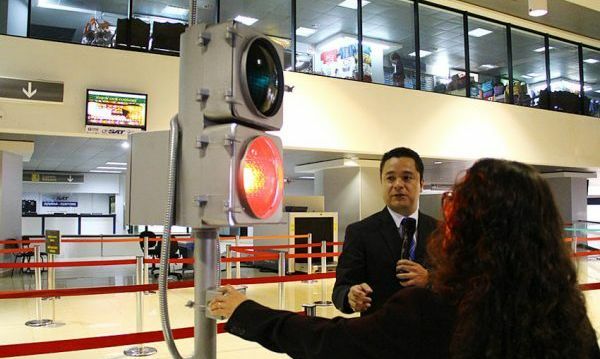 If you get a red light, they get to look through every piece of luggage. We were afraid that with a red light, we may be asked to pay taxes on the parts even though they were replacement parts, so we shouldn't have had to. 17 year old 'brick' panel, and the new one (it came with a frame to make it fit in the existing place on the panel). Pat took out the old motherboard, he had to cut the cables to get them out, and installed the new one into the box that we then mounted under the helm. The Servo motherboard goes in this box. The Servo box goes under the helm - in a location designed for smaller people. After installing the Servo box under the helm (that took teamwork), we then went to hook up the motherboard to the power box. We found the included new cables didn't match those on the boat. He called the manufacturer, "Oh I should have told you, you need to use the old cables as adapters" 😟. So we spliced the 2 cut cables back together and hooked it all up. The cables we had to cut to get the old system out - yeah, those had to be spliced back together. When we powered up the system (hoping it would just work), we got an error message "Lost communication with Servo". Since motherboards are more my thing than Pat's, I got into the crawl space to check all of the connections and finally found one in the wrong port. I moved that one and, 'ta da', the panel began communicating and showed the stabilizers (they showed off center, but no error messages at least!). The cable in the wrong port was the rainbow one in the upper left corner. It needed to be moved down one slot. Simple right? NOW we thought we had it. However, the fins need to be centered in the beginning and we couldn't get them to move to center. We were directed to expert Tony Fields with ABT. He spent a couple of hours with us on the phone, changing parameters and trouble shooting (Thanks Tony!). Eventually, using a voltage meter, we found that one of the power ports on the motherboard was only getting 4 volts of power (the others were reading at the required 24+ volts). That happened to be the port that gave power to the hydraulic valves that need to be open in order to actuate the fins. Those valves weren't getting enough power to do their job. Pat found an open port to switch the wire to, and the next time we turned the system on, the fins centered! We took Noeta out for a sea trial, with the adjustment of a few parameters, they worked great! So now we will wait for our next weather window and attempt crossing the Sea of Cortez again. So which stabilizer system do we like better? If you asked me last month, I would have definitely said active fin. Today, after hours in a crawl space built for a 5 year old, it may be 50-50. Ask me in a few months and if all goes well with our active fin system, I will probably be leaning back towards active fin. Stay tuned!